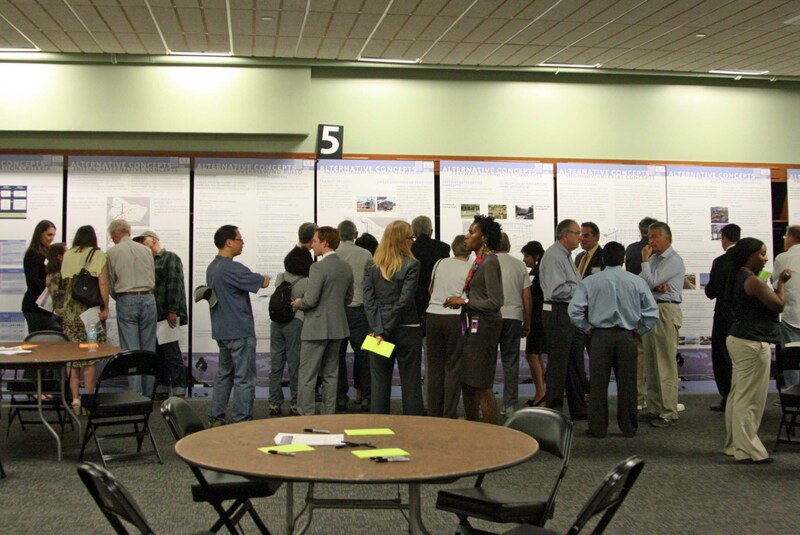 Last week, Metro finished its most recent public meetings outlining twelve proposals to fill the so-called 4.5 mile “gap” on the I-710 between Alhambra and Pasadena at the I-210. The public response to the twelve alternatives presented was near-uniformly negative. Anger was particularly high at new proposals to connect the I-710 to the I-210 including, a tunnel connecting the 10 Freeway to the 134 Freeway, a surface route that would widen Avenue 64 and a highway route along Huntington Drive, Fair Oaks Avenue and Pasadena Avenue. The newer proposals were viewed by many communities, including Alhambra, East Los Angeles, La Canada Flintridge and Pasadena as so ludicrous that it pushed the proposal to build a tunnel underneath several San Gabriel Valley Communities off the front pages. Maybe that was the point. No media coverage of the Big Dig option. No media coverage of the flood of trucks that would dominate San Gabriel Valley Streets. Little mention of that any expansion of the I-710 or surrounding freeways is a giant subsidy to the port and shipping industries. If the agency wishes people to believe that the short list of projects that will be studied in a full environmental impact report hasn’t been pre-determined, it would do well to not present the alternatives next month. Meanwhile, the reaction to several proposals on the list was so hot that Metro and Caltrans are either completely tone deaf or intended the reaction to make the tunnel proposal look closer to sane. Last week, a special meeting of the Pasadena City Council attracted 500 people. Many were from Pasadena, but the Star-News reports that many attendees were from the aforementioned surrounding communities that would also be impacted and/or divided by the proposals. The previous week, 250 people attended a meeting in Eagle Rock, worried about how expanding Avenue 64 would divide their community and how the rush of trucks that it promises could destroy their existing transportation infrastructure. Pasadena’s opposition made news because the government is barred from fighting the I-710 extension projects by a 2001 ballot measure. After the City Attorney opined that alternatives that created more traffic off the I-710 could be opposed, the Council quickly opposed every alternative they could. At least one Council Member believes the city can add more alternatives to their “don’t build” list because the tunneling options were not on the table when the voter initiative was passed. A second Council Member wants a repeal of the 2001 proposition put on the March 2013 ballot. Throwing cold water on the idea of Pasadena joining the fight against other 710 expansion alternatives, “freeway advocate” Nat Read opines that if the options that Pasadena formally opposed are taken off the table that furor in the City of Roses will calm down. By the end of the outreach, even the project manager admitted they needed to “retool” their efforts. Meanwhile, more bad public relations for the project reared its head. Last week, the state auditor slammed Caltrans for its incompetent handling of I-710 real estate. In 2011, Portantino requested that the state auditor review rental and repair records for the 500 homes seized by the state over a decade ago when a surface route through South Pasadena seemed likely for the extension. The audit shows that the incompetent management of the properties, i.e. not charging enough rent, and over paying for repairs, cost tax payers $22 million between 2007 and 2011. There is at least a small amount of good news. Thanks to a recently passed motion, the Metro Board of Directors can move Measure R (or Measure J) funds from the I-710 to fund an extension of the Gold Line and other transit projects in the San Gabriel Valley. $780 million could allow light rail construction all the way to the L.A. County border with plenty of cash to spare. Please turn the auto play off on this video. Poor form to have video with audio start playing without pressing play first. You forgot to mention that Nat Read is paid by the City of Alhambra to LOBBY for the 710 Extension. Nat Read was PAID by the City of Alhambra (and ??) to put Measure A on the Pasadena ballot in 2001. If Alhambra is concerned about car traffic, why do they push for a TRUCK route? What’s missing here is a failure to explain where 60 years of tax payer’s money has gone. Now they want more to “study” some more? An investigation is needed, now before another dime is spent. Stop the SR 710 extension now. The amount of density we have is too great to go on building freeways. The Ave. 64 proposal is just insane. These are historic neighborhoods. Just look at the Church of the Angels. It was constructed in the 1880’s. Its beautiful. The Garvanza neighborhood has been making great strides. Garvanza park was recently outfitted with a skate park and a water filtration system to filter, clean and use runoff from storm drains. Luther Burbank Middle School has been dramatically invested in with new buildings and now Metro/Caltrans/Port Tycoons want to plow a freeway/highway/tunnel over/under our community? Stop this madness now. NO BUILD! We need to stop this unwanted and unneeded project. The Alameda and Alameda East rail corridors will get most of the container truck traffic off the 710 freeway. We need to stop spending millions of our tax money on bring up this dead horse up over and over again. Just how much is spent on all of this new engineering money for something that will not get built? The port container traffic predictions for both the 710 corridor expansion and this tunnel/whatever are dead wrong. Theses projects, in their best case scenarios, won’t bring revenue to the agency responsible for building and maintaining them. These projects will destroy local quality of life, remove wealth from our local economy. That is in the best case scenario, as laid out in their own feasibility reports. We need to plan for a modest contraction in the shipping industry. We need to make our ports as cost competitive, and as resilient to shocks in energy prices and material shortages, as possible. Planning for another 30 years of truck-based shipping is planning for economic suicide.